View of the Painted Desert from Tiponi Point. Driving from one end of Petrified Forest National Park to the other is a total distance of 28 miles. Most visitors spend an average of 2 1/2 hours visiting the park. There are 21 overlooks and points of interest along the way. If you are driving from east to west on I-40 exit at #311 which will put you at the north end of the park. Make the Painted Desert Visitor Center right outside the entrance station to the park your first stop. Here you can pick up a park map, view the park film, browse the exhibits, orient to the surroundings, ask questions and perhaps purchase postcards or a book. Directly across from the visitor center is the Fred Harvey gift shop and restaurant. The restaurant is open until 3PM and the only place to eat in the park. The gift shop sells petrified wood that has been gathered from outside the park. Federal law prohibits the removal of any natural object from the National Parks. Remember as you tour the park you are welcome to pick up the wood, handle it and examine it but always put it back where you found it. Starting at the northern end of the park driving south on Park Road one mile the first overlook is Tiponi Point, the Hopi corn goddess symbol. Your first view of the Painted Desert here lays out the badlands at your feet colored with various shades of red and orange as seen on the mesas and buttes that rise from the desert floor before you. 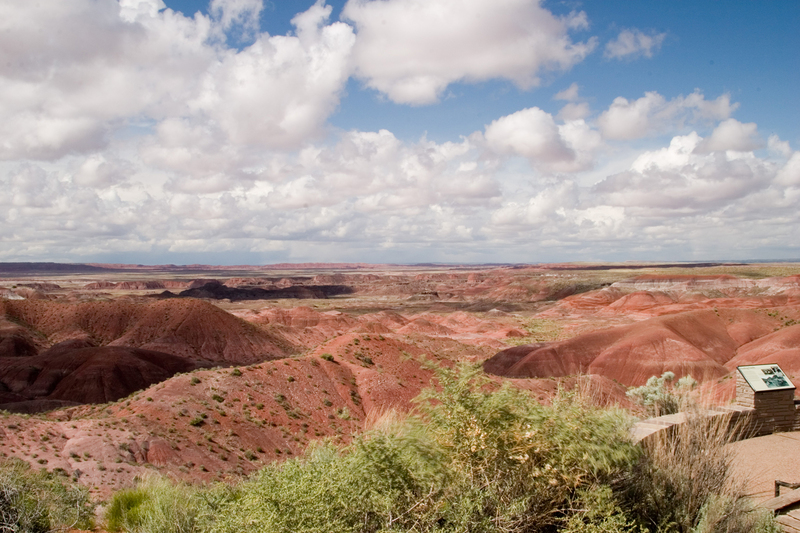 The Painted Desert is made up of Bentonite clay (sediment). As these ancient sediments deposited millions of years ago minerals in the rocks created the range of colors you will see throughout the park. The sparkle interspersed in the landscape is selenite. (gypsum) As you leave this overlook and head back to your car notice the bushes with pale yellow flowers growing along side the pathway. These are Apache Cliffrose. Take a moment to inhale the sweet scent of these flowers. This entry was posted in National Parks, Petrified Forest and tagged Arizona, Painted Desert, Petrified Forest National Park, Tiponi Point. Bookmark the permalink. Petrified wood must be an awesome sight. Great post and photos! This is a place I’ve always wanted to visit. Your blog is really terrific!